Found in FNA Volume 8. Treatment on page 391. Mentioned on page 373. Herbs, achlorophyllous, heterotrophic. Stems absent. Leaves absent. Inflorescences racemes, erect at emergence from soil, axis fleshy and fibrous, persistent after seed dispersal, white with red to maroon vertical stripes, 0.5–1 cm diam. proximal to proximalmost flower. Pedicels erect, somewhat elongated in fruit; bracteoles absent. Flowers radially symmetric, erect to spreading; sepals absent, rarely 2–5, distinct, linear to filiform; petals 5, distinct, white, without basal tubercles, (surfaces glabrous), corolla crateriform; intrastaminal nectary disc present; stamens 10, exserted; filaments terete, glabrous; anthers ovoid, without awns, without tubules, dehiscent by 2 oval slits; pistil 5-carpellate; ovary 5-locular; placentation axile; style straight, stout; stigma peltate, without subtending ring of hairs. Fruits capsular, erect, dehiscence basipetally loculicidal, no cobwebby tissue exposed by splitting valves at dehiscence. Seeds 100+, fusiform, mostly narrowly winged. x = 13. Copeland, H. F. 1938. 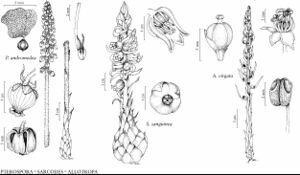 The structure of Allotropa. Madroño 4: 137–153.